Do you love inviting friends and family over for BBQ's and great meals? Then perhaps you would like to have the team at Design West Landscaping build you your very own BBQ pit. There is no better way to feed a group of people than a BBQ feast. It is great to get out in the fresh air and do some really fun outdoor entertaining in the comfort of your own backyard! We have found that homeowners want the option to entertain their guests in their outdoor spaces. So we have more and more requests for outdoor kitchens, outdoor fireplaces, fire pits and BBQ pits these days. If you live in the greater Northern San Joaquin Valley and East Bay area we can turn your landscapes into an entertainer's hub! Adding a Fire Pit or Outdoor Fireplace to your outdoor area makes a big difference in terms of aesthetic appeal. Also, this allows you to do such fun activities like roasting hotdogs or marshmallows with your kids or friends outside. Barbecue Pits were really popular back in the 1940's and 50's for homeowners. 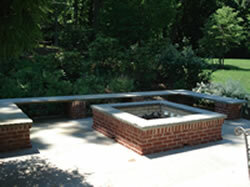 The brick barbecue pits were especially popular for homeowners who often built them themselves. The appeal of BBQ pits is that they are permanent and perhaps a lot more solid of a structure when compared to store bought BBQ grills. At Design West Landscaping we have the expertise and the knowledge needed to provide our clients with a broad range of BBQ pit designs. Leave such a task to a professional company for we have all the experience and the necessary equipment and craftsmanship to build you a barbecue pit that will serve you and your guests with great meals for many years to come. Another popular type of barbecue pit is the metal or steel pits. These are made using welded steel and metal to give you a BBQ that will last you a lifetime. If this sounds like something you are interested in then let the team at Design West Landscaping get you on your way to having your own steel BBQ pit today! At Design West Landscaping we understand that each client is different and has different needs. We also realize that every property is unique and space may be abundant or limited. We provide our clients with custom BBQ pit design and installation services. This means that we will work with you, one-on-one, and create a BBQ pit that is ideal for your cooking requirements, your budget and the space you available. We will also work out what type of cooking you enjoy and perhaps add various features like BBQ smokers also. Our designers and contractors will custom design and install your BBQ pit and create an outdoor entertaining space that you will be delighted with! At Design West Landscaping we believe that creating your own outdoor living space is in fact increasing the amount of overall living space you have. Why leave valuable outdoor areas bare and unusable? We can transform any outdoor living area into a prime outdoor entertaining space. This can involve a range of applications like outdoor kitchens, fireplaces, fire pits and BBQ pits. The sky is the limit when it comes to our range of ideas! Our professional designers and contractors have created so many outdoor living areas and would love to take on your space today. We will change the way you use your landscape settings and get them working for you. Enjoy those summer days and evenings so much more by sitting outside and entertaining your friends and family members!